Electric buses in Beijing. Photo courtesy of Jürg Grütter. Greenhouse gas emissions are growing throughout Asia-Pacific alongside the economic rise of developing nations. The transition to sustainable, low carbon transport is of paramount importance if Asia is to continue to pull its weight in a global battle against climate change. Well documented barriers to electric vehicle (EV) adoption include higher purchasing costs, the need for established charging infrastructure, and lack of a clearly defined EV policy. How can we overcome these obstacles and accelerate the adoption of cleaner transport solutions? Jürg Grütter, CEO of Grütter Consulting. Speaking at the Transport Forum 2018, themed ‘Financing the Future of Transport in Asia and the Pacific’ on 12-14 September 2018, Jürg Grütter, CEO of Grütter Consulting, outlined several potential actions for developing countries in Asia to prioritise CO2 reduction. To deliver the greatest impact on climate change and air pollution, with the lowest financial resources, Grütter proposed Asian nations direct their financial resources towards buses, high mileage vehicles, urban trucks, and large fleets, with an emphasis on cities — rather than on general policies that tend to favour personal vehicles. Thirty-five passenger cars deliver the equivalent CO2 impact of a single bus, he says. Subsidising the larger vehicle is a more pragmatic solution, he reasons. Though, reducing emissions is not as easy as simply directing subsidies. The entire system needs to be optimised, he proposes. China is a global leader in electric passenger car uptake and enjoys an even more dominant standing in the adoption of commercial electric vehicles. While registrations in Europe and India are on the rise, a colossal 95% of all battery electric buses (BEBs) are operating in China. Plugin hybrids of 10-12 m and smaller (6-12 m) BEBs are dominating. Hybrid buses have on average 20% lower fuel consumption than conventional buses whilst BEBs use three to four times less energy than normal buses, says Grütter. They are even far more efficient than the fuel cell EV, he adds. Electric bus in Guangzhou. Photo courtesy of Jürg Grütter. However, reality is not always as it seems. In a recent study which included 60,000 plug-in hybrid buses in China, less than 1,000 were plugged in, reveals Grütter. A staggering statistic. 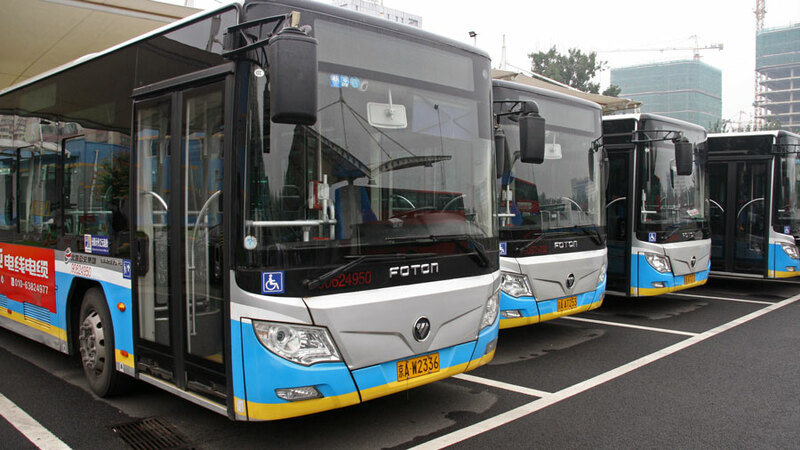 In China, operators are purchasing plug-in hybrid buses but using them solely as hybrids. “They never plug them in,” he says. This begs the question, why spend significantly more on plug-in hybrid technology and not use it? The decision is related to China’s subsidy policy. Plug-ins get subsidies, non-plugins don’t, he says. Why then, if you have made the capital outlay to purchase a plug-in hybrid, wouldn’t you use it properly? Grütter, an advisory board member for the Climate Technology Centre & Network, suggests the buses are “relatively complex” to use correctly from an operational perspective. While users can charge buses at night, they typically have a very small battery. Further, he says, most operators lack access to, or space for, charging stations. The hybrid efficiency means fuel will last longer anyway, and in many locations, the service cost of electricity means it is more expensive. Understandably, this doesn’t make financial sense to operators. The naysayers are quick to assert that using EVs in China’s ‘dirty’ grid doesn’t make sense anyway, or that battery manufacture uses so much CO2 it is worse than a fossil fuel vehicle. This is “simply not true,” says Grütter. “Even in China with a relatively dirty grid you still have 30% emissions reduction in CO2 on battery electric buses,” he says. Yes, emissions are produced off battery production. But when you consider all lifecycle factors — including lower emissions of vehicle manufacturing, a longer lifespan, and the lack of fuel extraction, EVs are far superior to fossil fuel vehicles, he says. Grütter has been working on vehicle emissions regulation for a quarter of a century and understands that air quality is a major issue in most cities in Asia. “You can forget about diesel being clean,” he says. “It’s only clean in theory.” In practice, many vehicles simply do not comply or do not complete regular maintenance because it is too costly. A research study of 2,500 buses in Chile revealed that 10% of particulate filters were not working, although Grütter concedes that this may vary in other parts of the world, such as in Europe where high particulate matter is not prevalent. When optimising an entire vehicle lifecycle, battery technology is an important consideration. In Europe, buses often use large battery sets, with significant weight, and slow charging times — thus you charge them overnight. You simply can’t recharge quickly in the middle of the day. Alternatively, China’s buses often employ smaller battery sets (around 150 kWh) that can be recharged quickly throughout the day as required. Beijing, for instance, uses 400 kW chargers that can have the bus recharged in 10 minutes and ready to run for another 80 km. Smaller battery sets mean the buses tend to be cheaper, require less maintenance, and reduce tyre usage because of the reduced weight, says Grütter. Maintenance costs are another important factor. Many attribute lower maintenance costs to electric vehicles. Grütter says this is only the case if you purchase a large fleet of buses. The European experience of pilot fleets was “a disaster,” he says. Lower maintenance costs are only applicable when committing to fleets in the vicinity of 50-100+ vehicles of the same standard. Small purchases of five to 10 vehicles are not cheaper than diesel. With bigger fleets, you avoid standstill times, can structure finance more cost effectively, and the cost per unit goes down. Electric buses in Yangzhou. Photo courtesy of Jürg Grütter. Energy costs will influence optimisation. Prices can range from 12 US cents to 30 US cents per kilometre for the same city depending on which battery and charging technology you use, says Grütter. In China, cities do not typically optimize their set up, he says, with the exception of Shanghai and a handful of other cities. They will purchase any bus, any battery size, and any chargers — and they are not necessarily compatible or suitable for their circumstances. The result? A system that is not well optimised and results in higher costs. Without subsidies, electric buses are more expensive to use in China. Grütter attributes this in part to China’s general approach of using buses for only eight years and very few kilometres (400,000-500,000 kms) — before scrapping them. A replacement battery could extend the buses’ life for a further eight years and would reduce the total cost of ownership for electric buses below that of diesel. Worldwide, many countries use buses for up to 1.2 million km. Low gasoline and diesel prices mean subsidies or financial benefits are very important in the adoption of EVs. Certainly, China’s EV fleet wouldn’t be anywhere near as impressive without the lure of vehicle subsidies. However, Grütter suggests that non-financial incentives are also useful in encouraging adoption, such as providing more percentage points in tenders for buses or trucks, preferential access to city centres, or even new routes reserved for EVs only.